Amy Dixon, the protagonist of Carlene Meredith Cogliati's To Durchhalten, loves words — their shape on a page and their sound, which she can almost taste on her tongue. She collects words not only for their intrinsic value and usefulness in expressing her feelings, but also to bolster her Spelling Bee prowess. So on the first day of sixth grade, when her teacher assigns a daily journal, Amy cannot be happier. She has no way of knowing that the entries will encompass so many changes — her old nemesis will turn into a friend, her current frenemy may not be as awful as he seems and her stable family life will be turned upside down. The author shares a year in the life of a young girl through this journal, allowing the reader to understand not only the situations that Amy encounters, but all of her changing reactions to these events. 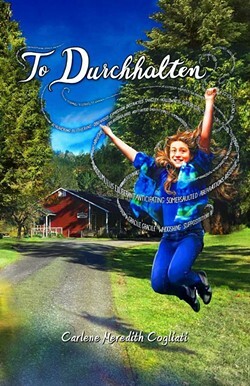 The voice is authentic for a preteen who faces challenges to many of her deeply held beliefs. Through this story, Amy is forced to examine much that she has previously taken for granted. The setting is a small, close-knit community that seems a lot like Maple Creek, where the author lives. Amy has attended a country school since kindergarten and knows all the other students and their parents quite well. In fact, Amy calls her best friend Heather Abercrombie's parents Mommy A and Daddy A. This surrogate family, along with Aunt Joan and Uncle Jon, come to mean even more to Amy when she learns of her mother's illness. For all the difficult issues that Amy faces in her sixth grade year, this book is also joyous and celebrates everyday pleasures, as well as bigger moments that mark the passage of the seasons. Amy is very human and doesn't always make the best choices, but in the end, she finds the courage to durchhalten, a Dutch word that means "to hold yourself to the course" no matter what life throws at you. This book is written for middle school children but it has a lot to offer for older readers as well. Adults who may have forgotten how intense feelings are at this age will get a poignant reminder. I found it an inspiring reading experience and an occasion for some nostalgia. JoAnn Bauer was the children's librarian at the Humboldt County Library for many years. Retired, she continues to support the HCL on the Humboldt Library Foundation Board. She is active in three book clubs and shares recommendations with anyone who will listen.